Margo Tamez, Indigenous Studies professor in the Irving K. Barber School of Arts and Sciences. 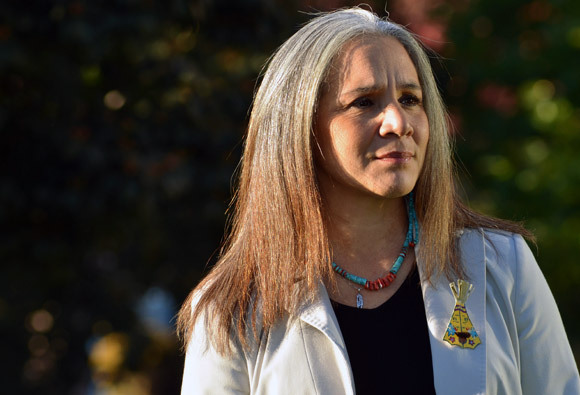 UBC Indigenous Studies professors Margo Tamez and Greg Younging returned recently from delivering talks at the Carlisle Symposium in Pennsylvania. The Carlisle Indian Industrial School was the first off-reservation boarding school, and it became a model for Indian boarding schools in both the United States and Canada. "Most, if not all Canadian residential schools were based on the model of Carlisle -- it was the ultimate regimented industrial model of assimilation in its day," says Tamez, who is a faculty member with the Indigenous Studies program in the Irving K. Barber School of Arts and Sciences. The symposium brought together Indigenous and non-Indigenous scholars, leaders, elders, artists, and community members to share their knowledge, research and experiences. "The goal of the symposium was to create a space for sharing, reflection, creativity, and scholarly work," says Tamez. "I am specifically interested in the possibilities afforded by human rights, international law, and Indigenous rights approaches to re-thinking the atrocities which occurred at Carlisle." Younging, who in addition to his role at UBC is the assistant director of research for the Truth and Reconciliation Commission (TRC) of Canada, delivered his talk, Living Through Violence: The Residential School Era and Its Legacy as Examined Through the Lenses of Direct, Structural and Cultural Violence. Tamez, who helped shape the vision of the symposium nearly two years ago at the Native American and Indigenous Studies Association conference in Sacramento, California, presented her research on the effects of militarization on Indigenous peoples, their lands and territories on international borders, specifically human rights violations impacting the Kickapoo, Tigua, and Lipan Apache Indigenous communities on the Texas-Mexico border. "Many Indigenous issues cannot get resolved in the traditional court system, and some important questions need to be addressed around the concept of reparation," says Tamez. "This is a discussion that needs to occur at an international level, and the Carlisle Symposium was one important step forward." For more information of Tamez's research visit http://www.ubc.ca/okanagan/ccgs/faculty/tamez.html.